Israel’s Benjamin Netanyahu is reluctant to unlock horns with the White House, even as he faces almost certain defeat in trying to block President Barack Obama’s deal with Iran. Last week, when it became clear he could not muster enough votes in the Senate to block a presidential veto, Netanyahu let fly one more punch. 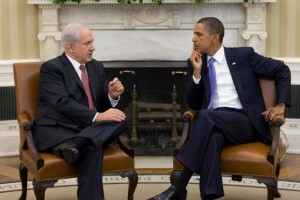 He observed that “the overwhelming majority of the American public sees eye-to-eye with Israel”, not their president. According to polls, a narrow majority of Americans reject the Iran deal. But ordinary Americans may be surprised to learn that Netanyahu’s hardline policy on Iran has long been viewed as implausible and counter-productive back home, among his own security officials. That verdict was underscored by the latest disclosures from Ehud Barak, who was defence minister through the critical years of Israel’s lobbying for an attack on Iran. Leaked audio tapes of Barak speaking to biographers suggest that he and Netanyahu pressed unsuccessfully on three occasions, between 2010 and 2012, for the Israeli military to launch a strike. Each time, he says, they were foiled either by the military’s failure to come up with a workable plan or by the reticence of fellow ministers as they heard of the likely fallout. In Washington, Netanyahu has cast himself as Cassandra, the forsaken prophet of disaster. His dire predictions have been based on two assumptions. The first holds that Iran is a replica in the Middle East of Nazi Germany. The single-minded goal of its leaders is to commit a nuclear holocaust against their enemies, with the Jews and Israel top of the list. Such claims should sound credible only to Israeli loyalists and the gullible. How is it that tens of thousands of Iranian Jews are living peacefully in the belly of the beast? And are Iran’s leaders really suicidal as well as fanatical, given Israel’s own, undeclared nuclear arsenal? The second assumption has become an article of faith for most western policy-makers: that Iran is actively trying to build a nuclear weapon. It is easy to forget that many experts, and US intelligence agencies, doubt that has been the case for more than a decade. On these flimsy premises, Netanyahu has constructed an equally dubious conclusion: there can be no negotiating with evil. Given his precarious position in defying a US president, Netanyahu has been coy about explaining what alternative he believes Washington should have pursued in place of the current agreement with Iran. In an effort to divert critics from the lack of a real strategy, he has even suggested he is not opposed in principle to Iran being allowed a civilian nuclear programme. But if Iran is really Nazi Germany, as he says, or simply exploiting its energy research to reach the threshhold of developing a bomb, as more cautious critics allege, how can Netanyahu contemplate opening that particular door to Tehran? The truth is that Netanyahu disapproves of any agreement. He would prefer an intensification of sanctions, forcing Iran to break free of the Non-Proliferation Treaty and conceal its nuclear research from all scrutiny. Then his warnings would sound more compelling, as would his demands that the US lead an attack on Iran. Above all, Netanyahu wishes to prevent a rapprochement between the US and Tehran, one that might weaken Israel’s hold on Washington’s Middle East policy and increase the pressure for a real peace process with the Palestinians. Barak’s leaked comments, meanwhile, have damaged everyone involved. The former defence minister has been publicly rebuked as a blabbermouth, and Netanyahu derided for being so ineffectual his cabinet spurned him at what he claimed to be the most fateful moment in Israel’s history. As former foreign minister Avigdor Lieberman has noted, continuing leaks of high-level discord over Iran have made Israel look “ridiculous”. But the tapes’ enduring significance – whatever embellishments Barak made in the telling – is that they confirm years of intimations from Israel’s security establishment that it stood firm against Netanyahu’s reckless approach on Iran. From Meir Dagan, the former Mossad spy chief, to Gabi Ashkenazi, the former military chief of staff, Israel’s security elite has hinted loudly that it was blocking Netanyahu’s efforts to provoke regional conflagration. Such was the opposition, one may suspect that even Netanyahu and Barak began to have doubts. Had they truly believed Israel could be saved only by bombing Iran, would they not have moved mountains to win over the cabinet and defence establishment? More likely, Netanyahu concluded some time ago that Israel had no military option against Iran. So why fight a doomed battle on Iran to the bitter end, further damaging Israel’s already frayed ties with Washington? Doubtless, Netanyahu expects to extract yet more concessions from the White House, from upgrades to its US-supplied weapons systems to US guarantees of diplomatic protection in international forums. But Netanyahu hopes for more. Last week the Israeli media quoted sources close to Netanyahu saying he knew he would lose on the Iran deal from the outset but carried on regardless. The goal was to convince the American public, not Democratic legislators. Netanyahu’s current bluster starts to look like it is aimed less at the nuclear deal than at President Obama himself. Is Netanyahu hoping to turn the Iran issue into a doomsday electoral weapon against the Democrats, helping to clear the path into the White House next year for a Republican. That way, Netanyahu may believe he can still emerge the victor, with a hawkish new president prepared to push Iran back into the US line of fire.